You might be thinking, "Why aren't they sprouting like crazy?" I’ve been there. Many times. I still feel that way at times. Netflix, Uber and other popular on-demand services don't help, either. Although none of us are as naive to think that everything happens overnight, we all secretly hope for that overnight success to magically happen by a snap of the fingers. Do you know what else doesn't help? People's relentless updates on social media. What are they doing all day? They are everywhere! Right?! The reality of it is, they have a larger team behind all of that. I know this, you know this, but it still doesn't help. So, when you worked on your business intensely and put your work out there, you are not thinking much about hearing crickets. Instead, you prep yourself to receive feedback, comments, inquiries, and maybe even a few new orders. Just to clarify, I'm not talking about big launches and campaigns here. For those chunky projects, we are mentally better equipped to handle not-so-positive outcomes by having more lead time and multiple strategies in place. This is more about carefully planning and executing on smaller, incremental business activities i.e. sales, content marketing, pitches, and outreach efforts that require consistency. Because those activities must occur consistently over a long period of time, it's important for us to be mindful about skillfully managing our expectations. Maybe you are waiting for someone to reply to your collaboration proposal. Maybe you made an offer to your prospect who seemed committed to moving forward. Or, you gave a shot at a long-form blog post for the first time incorporating more graphics, data and research materials by spending twice the time than usual. If you are feeling slightly sick to your stomach, I'm there with you. It's nauseating for sure. Here are 3 tips to help you manage your anxious feelings and to navigate Days of No Wins at ease. Tip #1: Do the "Farewell Ceremony." Our logical side of the brain understands we have no control over what we send out into the world after carefully considering what kind of desired outcome we seek from doing so and the possibility of not getting what we want. We also understand, at times, that all we can do is to wait. However, our emotional side grows impatient and nags that all we did was just a waste, plus other negative narratives that fill our brain. Sound familiar? As I reach out to hit the button, I say to myself, "It's been a privilege to work on this. Thank you. Whatever happens, it's out of my hands. I'm letting you go. 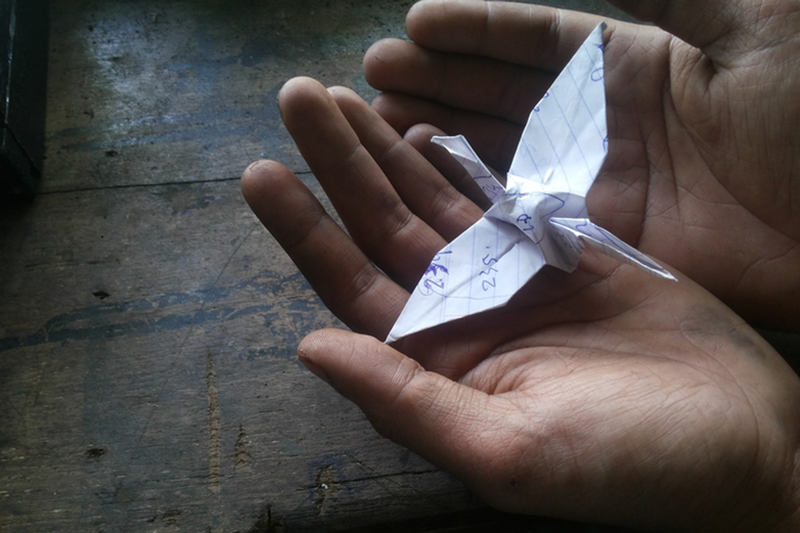 Fly away and enjoy the journey." That's it. Easy, right? This gives me a sense of closure and makes it easier to move onto my next task. Just to make it even more effective, I recommend you imagine holding a little bird in your hand, and as you open your hands you are allowing it to fly away. Tip #2: Know What You Do Next Before You Hit that Button. What you don't want is to give yourself a chance to think about things you have no control over. You might already have your daily to-do list to work off of. Just to be on the extra safe side, you want to be very clear on what you will do right after you ship your work. It provides the edge you need to keep going without worrying about what will happen to what you just sent out. If you have read a few of my posts, you probably know what I say next. “Don't just come up with low-value tasks just to keep you busy!” It’s a sure way to make you feel empty inside. Have a few projects that require deep thinking handy. Needless to say, those projects should also be something that helps grow your business a.k.a. high-value tasks that excite you! Another way to help you move away from what you just shipped is to do activities that take you outside of your work environment such as going for a run, helping out a community group you belong to, or visiting your friends. Once you are immersed in one of those, you are no longer obsessed with what's out of your hands. The key is to be fully prepped to move onto your next activity. If you feel like going for a run, before you hit that button to send your work out, you should have your running outfit on and your shoes tied. If you are ready to tackle one of your high-value tasks, be sure to open up a tool or a platform you plan to work in before you hit that button. It's impossible to fill your days with endless positive feedback from others. No one has days like that, even the influencers you look up to. Yet, after a few days or even a couple of weeks of no major wins, your anxious feeling turns into feelings of annoyance and doubt. When I find myself annoyed or frustrated with Days of No Wins, I shift gears. What works for me is to meditate by imagining myself observing a cycle of four seasons: Spring, Summer, Fall, and Winter… I stop to give myself enough time to think about cold winter. Think of flowers that grow out of bulbs like Amaryllis or Tulip. I imagine they are enduring the long winter under the soil recharging for springtime. Then I imagine myself being that bulb under the soil. On the outside, those bulbs don’t seem to be doing anything. They are just there with no actions you can report. But you know, on the inside, things are happening. I focus my thoughts on that inner activity of recharging to acknowledge there are reasons we have Days of No Wins. Call it a woo-woo. It is all about having the right mindset, and I would use whatever works! In this case, the practice gives me a perspective of life continuously evolving; it never stagnates. Imagining myself as a bulb charged with energy and readying for the big moment helps me to stay calm. Days of No Wins are a good thing. 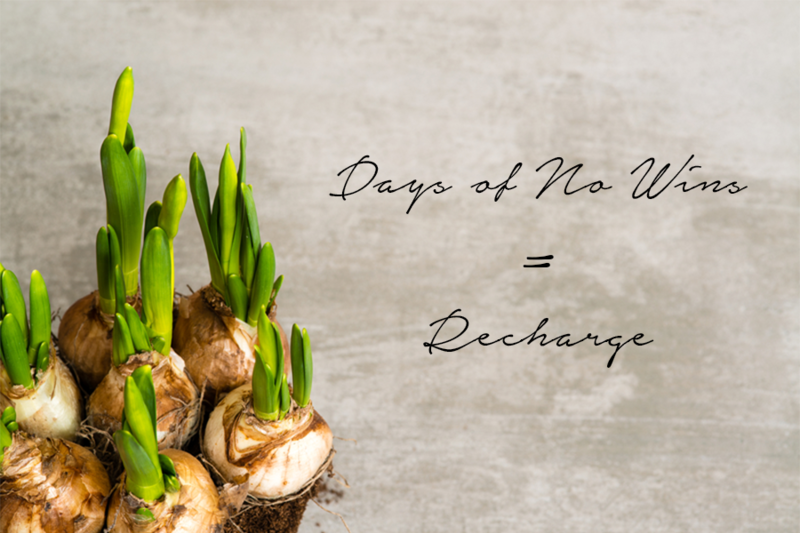 We all need these days to recharge. This is not a bad idea. It works for those who tend to give themselves less credit. They may be doing incredible work, but they don't acknowledge all that work. It makes sense. Credit where credit is due. I'm not being ungrateful for incremental progress I make, or I only focus on big wins; I choose not to put emphasis on the act of identifying small wins for myself as it (the act) makes me feel more miserable as if I need to search for them. Give Small Wins to Others. Do you believe in building good Karma? I do. My time is better spent on recognizing small wins that belong to others as it is a good way to give them a little encouragement. Your peers, team members, suppliers, business partners or even customers, especially if you are in the B2B business, may be feeling down about their Days of No Wins. Turn your spotlight away from you and put it on them, instead. Not only do they appreciate you giving them a nod, but also some of them will remember to return the favor in the future. See, that’s good Karma. I would love you to share your thoughts on how you deal with Days of No Wins. Better yet, comment below if you give these tips a try, I want to know how they worked out for you. Chin up! Your big wins are coming!